Save time, money, and trees. Collecting signed paperwork feels a bit like herding cats. There’s always one missing, and it’s enough to drive anyone bonkers. But if you have BambooHR’s electronic signature software to help you streamline the process, you can make experiences like onboarding and open enrollment easier for employees while also keeping documents organized and accessible. You’ll save time by automating signatures, money by ditching filing cabinets, and trees by leaving them alone. Your days of hunting wild signatures are over. 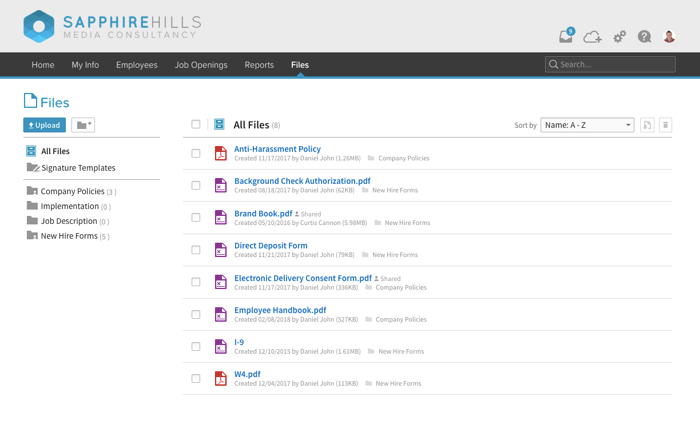 Streamline your processes with a seven-day free trial. No more dealing with temperamental printers, searching for lost forms, or running to the post office to overnight important paperwork. 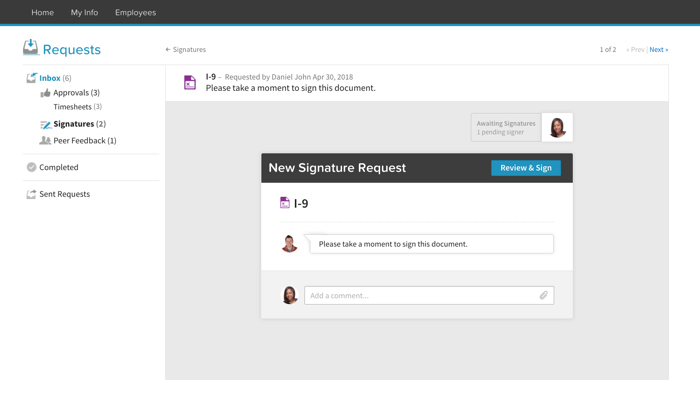 With electronic signatures, you can get forms to your people in seconds and track their progress until completion. By running a report to determine which documents are signed and which are still pending, you can prevent bottlenecks and keep the process moving. And since all the data is backed up on our servers, you’ll never have to worry about a lost form. We’re all about making your job easier. Build an excellent employer brand. Your organization only gets one first impression when it comes to new hires—let us help you make the most of it. 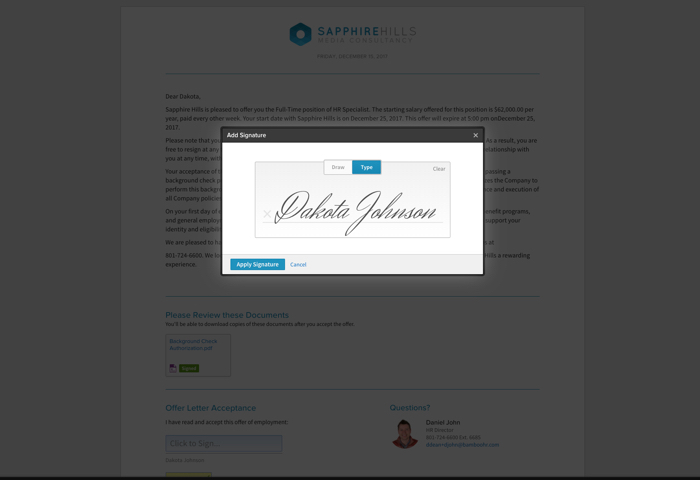 Our digital signature software makes onboarding paperwork a breeze. You can send all the necessary forms to the new employee, and they may submit their digital signature at their own convenience. Not only does this improve employees’ experience on their first day, it also says a lot about your organization. Candidates looking for green, technologically savvy, and efficient organizations tend to notice things like that, and employees do, too. E-signatures cut down on operating costs. While it might not seem that expensive at face value, the cost of paper, ink, printers, postage, and other resources adds up quickly. And if your organization continues to grow, you’re only going to see more expenses pile up from printing and distributing forms. That is, unless you use electronic signature software to cut down on costs. We can help you generate, send, and store all of your important forms digitally so you can say goodbye to those old printers, bulky filing cabinets, and reams of paper. Security and compliance to help you sleep at night. You already have enough on your plate without worrying about protecting your organization’s sensitive documents from unauthorized access or falsification. But don’t fret—we’ll manage all of it for you. We protect signed paperwork with enterprise-level encryption, best practice security controls, constant vulnerability evaluations, and regular server backups—all of which far exceed the security of an old filing cabinet. To maintain compliance, employees always receive emailed copies (with a seal and document ID) when they sign documents. 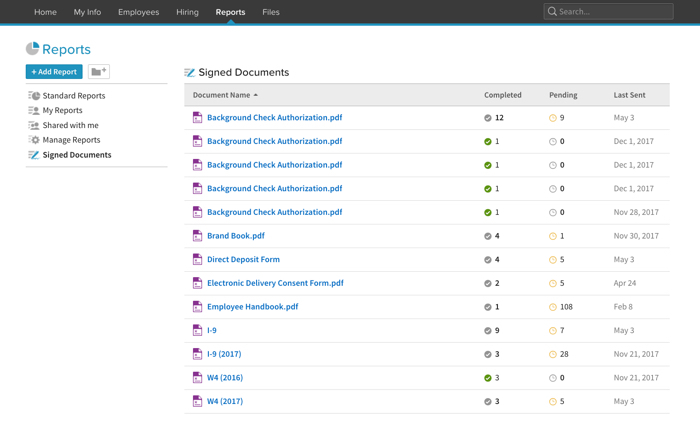 They’re also able to view signed documentation at any time on our database. You can rest easy with BambooHR on your side. 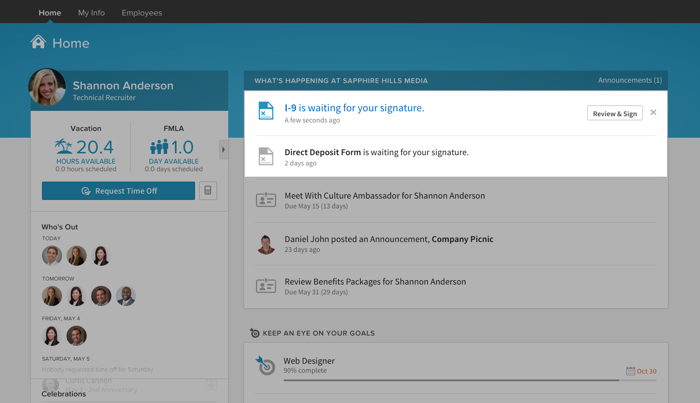 No more lost forms or missing signatures. Do you ever feel like a part-time detective when it comes to tracking down misplaced documents or following up about signatures? Well, you can hang up the trenchcoat and magnifying glass because BambooHR does the sleuthing for you. 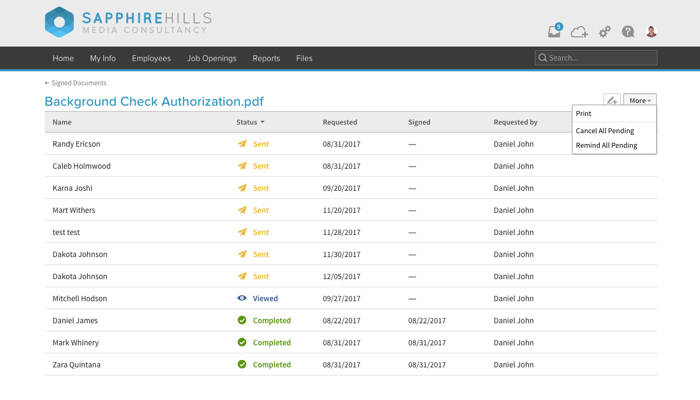 In only a few seconds, you can generate a signed document report to identify who’s submitted their signature and who hasn’t. This helps you—and everyone else involved—keep track of the process, eliminating bottlenecks and inefficiency. Plus, you can go back to being a full-time HR professional. Digital signature notifications keep you on track. There’s a lot going on in your busy organization, so it’s easy to see how a quick signature request could fall through the cracks for some managers and employees. But to do your job properly, you need those documents signed, returned, and processed in a timely manner. That’s why we include digital notifications on the homescreen of your organization’s BambooHR database. Every time an employee logs in to view their time-off balance, benefits, or workforce directory, they’ll see a friendly reminder at the top of their screen. We keep everyone on track for you so you can collect important information and do your best work.